While other flowers like petunias, pansies, marigolds will dry up quickly, a major advantage of purchasing a hibiscus plant is that the plant will continue flowering for at least a year. During winter and spring , it appears that aphid attacks on the flowers are frequent due to which the stem is getting a white coating and flowers do not bloom. During summer due to the heat, in May 2016, the number of ants and aphids are relatively less, and the hibiscus flowers are again blooming. 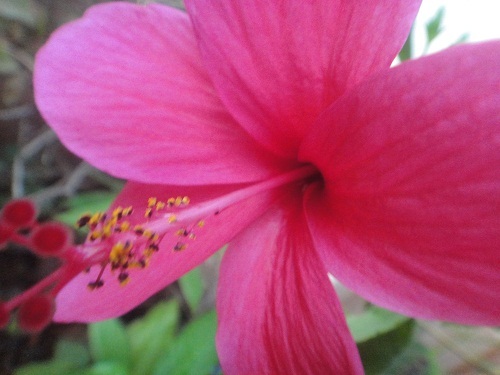 However, due to the earlier ant and aphid attack the hibiscus plant flowers have been affected to some extent. Some of the flowers which are blooming do not have any petals at all. Unlike the flowers with petals which bloom for only one day , the flower with no petals is blooming for two days before withering and falling off. Any advertising related to flowers, gardening or related topics will be greatly appreciated. While 8-9 lazy greedy fraud RAW/CBI employees are getting a salary and great powers for falsely claiming to own the website and associated paypal account, without spending any money online or doing any work, the real domain investor,a harmless single woman engineer is not getting anything due to the fraud of some powerful ntro officials who are making fake claims about website ownership, abusing their powers .